10th Street Home: WEEK 1! 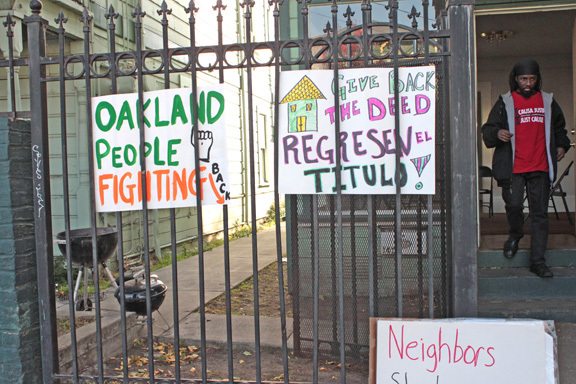 The “Occupy Our Homes” national day of action on December 6th saw unprecedented numbers of homeowners taking action to take back or keep their homes. 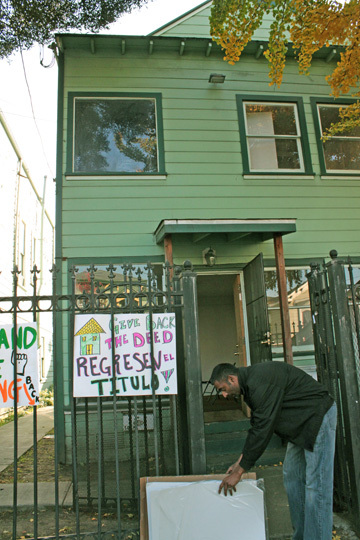 On that day, the 99% and Occupy Oakland activists took over a Fannie Mae-owned vacant property at 1415 10th Street in historic West Oakland that is now being used as housing for formerly homeless folks and for community meeting space with support of CJJC. This Saturday, Dec. 10, at least 60+ people turned out at the house, some of them young children and their parents for a story time circle organized by the Colorful Mamas, while other folks came for the membership meeting where participants shared their stories about their fights against foreclosures and to offer support. The neighbors have been extremely supportive and the broader community as well. With the help of a crew of volunteer plumbers from the neighborhood and from Occupy Oakland, the plumbing now works! Take Action, Sign the Petition! If you have already signed, CALL Fannie Mae on Tuesday, December 13th. Read more below…. The 10th Street home was occupied to pressure Fannie Mae into giving back the deed to the Ramirez family whose home was foreclosed on earlier this year. The loan servicer, Bank of America, pretended to negotiate with Margarita Ramirez, a CJJC member and domestic worker from East Oakland. Instead, they sold the home two weeks early. Thanks to your support in July B of A agreed to rescind the sale & modify the loan, but Fannie Mae is now standing in our way. Neighborhood activists are occupying the vacant house as leverage to pressure Fannie Mae to return the Ramirez family’s deed. If you agree that Fannie Mae should give the Ramirez family their home back, help us pressure Fannie Mae into doing the right thing. Please sign this petition and pass it along to your networks. We need to get as many people as possible to sign this petition to show that the Ramirez family has the support of a huge community who will not stand by idly while Fannie Mae allows families’ home to be stolen. As a government program, Fannie Mae should be working with families to help them keep their homes. 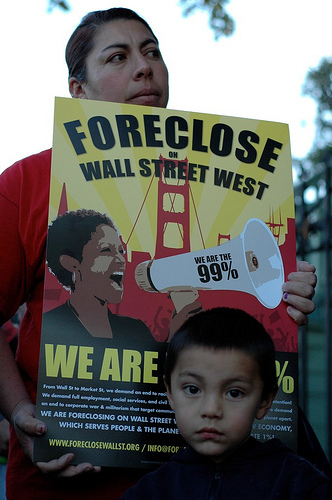 “I’m a supporter of the home occupation to get the Ramirez family their deed, and I am a member of the 99%. 10th Street House Needs Items/Donations to Stay Strong! If you can donate some items, here are our most urgent needs for the house. Please let us know. Email us at 10thstreethome@gmail.com or give us a call at 510.239.3460 or drop them off between 11am-8pm daily. 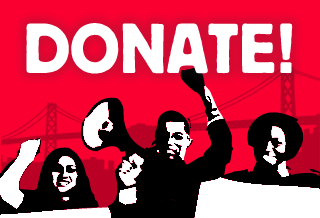 Or DONATE FUNDS to help us support this work.